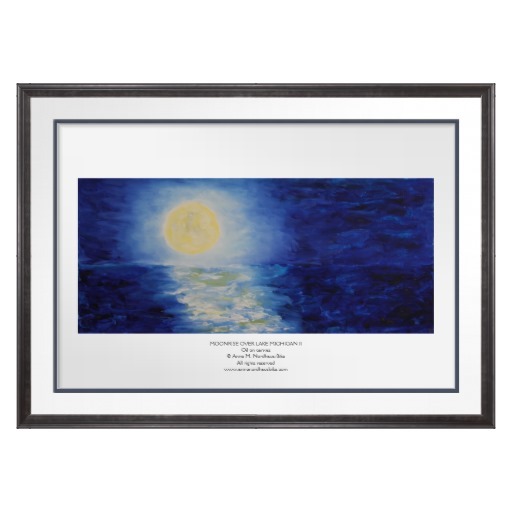 This exquisite framed poster of Anne Nordhaus-Bike’s original oil painting, Moonrise Over Lake Michigan II, is one of hundreds of premium, designer gifts available through our Zazzle store. Shown here is the Moonrise poster, custom framed with a 2.5-inch white conservation mat, a second mat in navy blue, acrylic glazing, and a handmade silver antiqued frame. Our premium art and zodiac gifts are available through our exclusive arrangement with Zazzle. We offer housewares – pillows, mugs, ceramic tiles, and throw blankets – as well as greeting cards, birthday cards, and exquisite custom framed posters. Zazzle offers an Associates Program for affiliates. Get paid a percentage of sales when you share our exclusive designer products, featuring Anne’s unique blend of art and astrology, on your blog, website, and through social media. Each time a visitor clicks on your referral link and makes a purchase on Zazzle, you can earn a 15% referral fee on that sale. It’s free to join the affiliates program! Here’s how to get started. Create a Zazzle Account: create an account on Zazzle or login if you already have an account and go to your account section. Get your referral ID: Visit the associates section to get your referral ID. Start earning money! Earn money each time someone clicks on a link with your referral ID and makes a purchase. It’s that easy! Get started now. Visit the Zazzle Associates Program page for more details and for a link to set up your account.